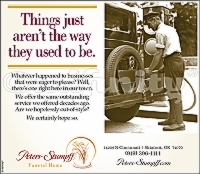 The premiere source for funeral home advertising. / I don't want to be buried in a suit. I'm a football fan. I don't want to be buried in a suit. I'm a football fan. Only available to clients who license television commercial #091204. 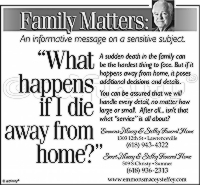 What happens if I die away from home? Things just aren't the way they used to be. » I don't want to be buried in a suit. I'm a football fan. Products related to "I don't want to be buried in a suit. I'm a football fan." adfinity is a full-service advertising agency with deep roots in the funeral service industry, but branches that spread to financial institutions, retail outlets, service companies, manufacturers and more. If you don’t see something on the site, don’t worry — we can still make it! Clients love us because we’re super-easy to work with and produce affordable advertising that works. Give us a try! © adfinity. All rights reserved. Be the first to find out about our latest creations and special offers.